Binoculars are an optical gear for you to capture stunning views while observing and focusing on distant objects to bring them as close to you as possible. They are made of two small telescopes attached side by side to provide you with a close-up of things far away. They overcome the limitation of a telescope to view or focus on things through one eye because they let you do that using both your eyes simultaneously. The small size of binoculars makes them portable for you to carry around while traveling or taking part in outdoor activities. Binoculars are ideal for bird watching, wildlife viewing, nature observation, hiking, hunting, stargazing, and even sports viewing. What is meant by 8×42 Binoculars? 8×42 is simply a configuration of a pair of binoculars. The two numbers represent two separate performance measures. The first number refers to the magnification power and the second refers to the objective lens diameter. This means that in an 8×42 binocular, 8 refers to 8 times magnification power i.e. the binoculars can make the image appear 8 times larger than its actual size. The 8×42 configuration of a binocular is sometimes considered to be the universal configuration because it is practical and adequate for all types of situations. Sometimes, 10×42 is also considered a standard configuration because it provides a wider field of view. 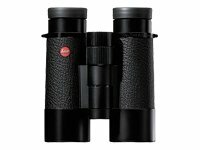 What to look for in 8×42 Binoculars? Binoculars are very carefully calibrated pieces of equipment. A lot of money is involved in purchasing one of these optical devices. Thus, before you make a purchase, it is important to know all that you can about the device. There are certain factors that you can look into and learn about before purchasing a binocular. In the following segment, we will be looking into some technical terms and contributing factors. This is a simple term and needs no real explanation. Magnification refers to the capability of the device to enlarge the size of the projected image. The magnification is given in numbers. For example, 10x magnification means the projected image will be 10 times the size of the original object. 8x magnification is also a fairly good magnification power. However, large magnification is known to have bad performance in low lighting and also tends to blur the image. When the reflected light from an object enters our eyes, we are able to visualize things. The more light that enters, the better you can see. The objective lens is the first lens which lets the light enter the scope and its size decides the amount of light allowed to enter. Since more light means a better image, a large objective lens is preferred by people. A large sense does affect the weight of the binocular. Exit pupil is on the user end of the binocular. It is the part of the binocular which acts as a gateway from which the image enters the eye of the user. It is ideal for all the light exiting the binocular to enter our eye. This is only made possible if the aperture of the exit pupil is small enough to focus all of the light into our eyes. When looking for a binocular, go for a small exit pupil. The more you can see from the binocular the better. Field of view is the amount of area that is visible when you look out of a binocular. The field of view is generally given in the terms of degrees is displayed on either side of the viewer. A large field of view is always a good thing as you can view a large area with just one position setting. A small field of view will cause you to move around and adjust your position continuously. Eye relief refers to the distance between the user’s eyes and the exit pupil. This distance is generally calibrated based on where will the exit pupil display will project the final image. It is advisable to go for a movable eye relief rather than a fixed eye relief. This way, you have a range of adjustments that you can make. Also, go for a silicone covering over the relief for ease of use and longer viewing time. Lenses are made of glass which, by its property, reflects back some of the entering light. This reflected light tends to cancel out the entering light, disrupting the picture quality. In order to avoid such distortions, the lenses are coated to reduce reflection. The coatings are also made of substances which help reduce optical disruptions. A binocular is a bulky instrument, especially if it’s very powerful. The large size of the objective lens and the material used to build it add to the weight. Since a binocular is mostly an outdoor device, it is important to make it durable. It is integral that durable material is used to create your binocular. This factor will make sure that you get to use the binocular for a long period of time. In order to compensate for the weight, a tripod is advisable. Leica Trinovid HD Binoculars are a powerful pair which possesses appealing external and internal features. The ergonomic design and excellent appearance are paired with world-class optics. The resolution is excellent even in low light conditions and other challenging situations making them suitable for your outdoor excursions like bird watching, wildlife viewing, nature observation, etc. The overall structure is well balanced and is not overly heavy. The model supports durability and intelligent mechanics. These binoculars produce sharp and clear images with an excellent level of brightness. Leica Trinovid HD Binoculars are a compact pair of binoculars with the 8x magnification power and 42 mm objective lens diameter. High optical quality and mechanics are guaranteed along with a compact and unique design which makes them all the more appealing. They are easy to handle and along with being compact and lightweight, they are extremely robust. They are definitely a pair of binoculars that will remain your long-term companions. Leica Trinovid HD Binoculars are impressive in terms of their ergonomic design as well as the comfort of use due to the presence of long eye relief. They also come with rubber ratchet shells and possess exceptional close focus capabilities. This makes them an ideal choice for insect observation as well. The field of view stands at 372 feet at 1000 yards which is very impressive given the compact and ergonomic design. Eschenbach has been in the binocular industry for more than 100 years and has made a name for themselves by focusing on high-quality optics and products. 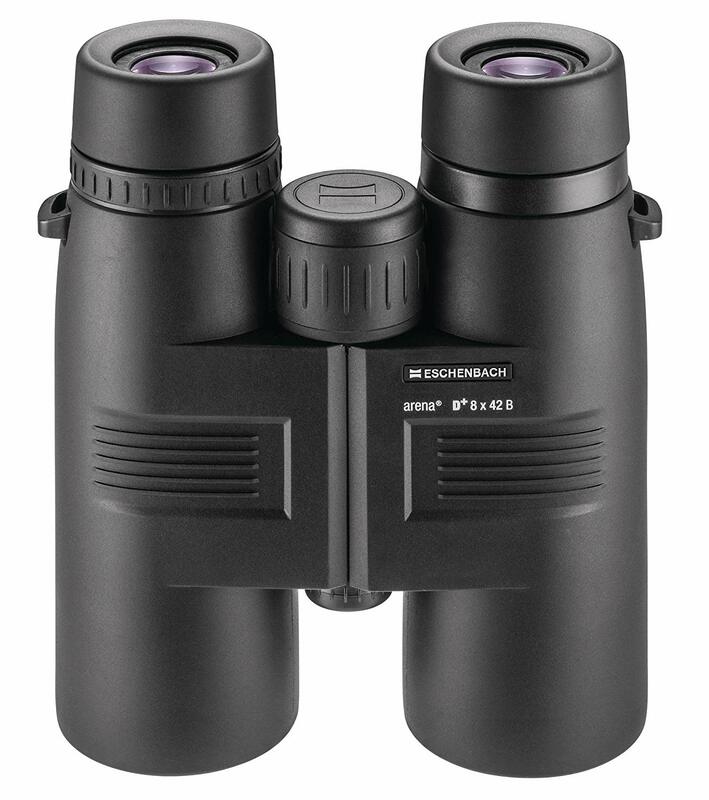 Eschenbach Arena D+ 8×42 Binoculars are one of many of their creations which have been designed to keep the weight at a bare minimum. The chassis is made of a material called PPS, a thermoplastic polymer, which helps in maintaining the lightweight property of this model. The 8x magnification along with a 42 mm objective lens diameter makes them a powerful optical piece along with a compact and lightweight body. The rubber armor is sleek and smooth but slightly slippery. They are ideal for leisure and travel along with more extensive activities like bird watching, nature observation, wildlife viewing, sports viewing, etc. 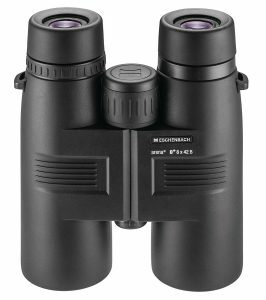 Eschenbach Arena D+ 8×42 binoculars are high powered yet compact. But they lose out on comfort due to a rather short eye relief. The optical quality is high with the lenses fully multicoated and prisms silver coated which reduces reflection. This helps in producing high quality, sharp images with reduced chromatic aberration. The images maintain adequate levels of contrast and sharpness. The field of view for this pair of binoculars is 107 m at 1000 m which is slightly disappointing given its high-end optics. The lenses have exceptional additional features such as nitrogen filling for water resistance and a shortened near-point. 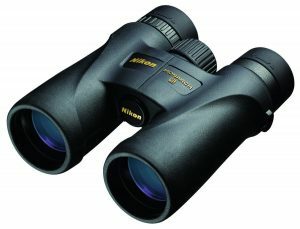 Nikon PROSTAFF 7S 8×42 Binoculars are an ideal choice for those who wish to own good quality binoculars from a reputed brand at an affordable price. They are an excellent pair of binoculars with a stylish design and are one of the most popular binoculars among the masses. Their high quality and innovative components make for a highly desirable pair of binoculars. They fall into the lightweight category because of their total weight of just 650 grams. The ergonomic design features an exterior armor that is rubberized and non-slippery for optimal grip. The rubber coating provides shock resistance and makes them a durable pair of binoculars. Nikon PROSTAFF 7S 8×42 binoculars come loaded with lots of optical and technological features including phase corrective coated roof prisms, multicoated eco-glass lenses, adjustable eye relief and are waterproof as well as fog proof.The fully multi-coated lenses produce bright and clear images by maximizing the transmission of light through the binoculars and reducing reflection and glare. Phase corrective coating on roof prisms reduces chromatic aberration significantly. They boast of an all-terrain applicability because of their resistance to water and fog. The O-Ring seal and nitrogen filling makes it possible to prevent moisture from entering the unit and causing problems. This further helps in protecting the binoculars from dust and impurities, making them dustproof as well. Steiner Skyhawk 3.0 binoculars are an extremely high-quality pair of binoculars that you can own at an affordable price. They come with an extensive list of features and are worth the hype. They make use of high contrast optics which provide bright, sharp and clear images for exceptional performance in outdoor activities. They also have a fast close-focus mechanism with a central focusing wheel which requires minimal rotation. 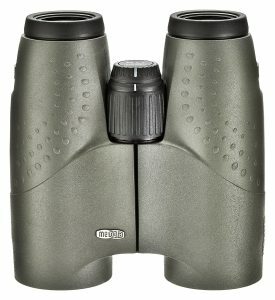 Steiner Skyhawk 3.0 Binoculars are built for rugged use and are pretty durable and sturdy because of their polycarbonate Makrolon housing along with an NBR-Long life rubber coating. The rubber coating is resistant to substances such as oil or acid and provides a non-slippery grip. These pair of binoculars offer water, fog, and dust resistance as well because of the nitrogen filling. The binoculars are ergonomically designed which makes them suitable for long-term observations. The eyecups protect the eyes from light, dust, and wind. The field of view for this pair of binoculars is 125m at a 1000 m.
Another feature includes a distance control system which allows you to predefine the distance you want to observe from. This pair of binoculars weighs about 740 grams which makes them slightly bulky as compared to other binoculars in the 8×42 category. Yet, Steiner Skyhawk 3.0 Binoculars are one of the best in the category of 8×42 binoculars and have no significant or critical weaknesses. Olympus Pathfinder EXPS-1 binoculars provide high-quality optics and user-friendly design at an affordable price. They are equipped with high-quality Porro prisms which provide bright and clear images. The optics are spectacular with not a single flaw. These binoculars come with a solid rubber casing. The lenses and prisms are multicoated for increased brightness and visual clarity and decreased distortion and reflection. Additionally, UV coatings are used to prevent the transmission of harmful rays. These binoculars possess excellent light transmission capabilities. Olympus Pathfinder EXPS-1 8×42 binoculars are considered to be slightly bulky due to a weight of 780 grams which is a bit higher than the other 8×42 binoculars. They also have a very narrow field of view of about 114 m at a 1000 m. The binoculars are ergonomically designed to provide easy handling and come in a stylish and compact casing. The BAK-4 high index prisms ensure crisp, edge to edge images with very low distortion. 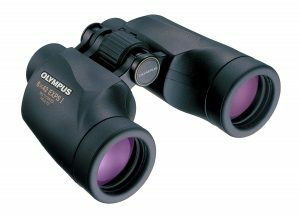 Olympus Pathfinder EXPS-1 8×42 binoculars also have a built-in dioptric correction which gives them the ability to adjust to individual eyesight. These pair of binoculars are ideal for sports observation, bird watching, hunting, hiking and other outdoor activities. Swarovski EL Swarovision binoculars are a revolutionary pair of binoculars with the addition of latest optical and technological innovations. They provide razor-sharp clarity and uniform brightness in their images. They are the perfect binoculars for outdoor excursions and low light conditions. They not only offer superior quality images but are laden with luxury. If you are a person that doesn’t mind shelling out big bucks for luxurious yet high-end items, then these binoculars are for you. This pair of binoculars employs an improved coating technology which remains unmatched by its competitors and has set a new standard for optical brilliance. These binoculars offer optimum contrast even in low light conditions. The 8.5x magnification and 42 mm objective lens are enough to provide high-quality images, but these binoculars have something more to offer. The lenses and prisms are made of European glass which makes the much-needed difference and the innovative multi-coatings enhance the light to produce the brightest image possible. The high-density (HD) glass provides high-quality color, contrast, and image resolution. The fully multi-coated lenses increase light transmission and the anti-reflective coatings reduce reflection and glare. Swarovski’s Swaroclean lens coating repels dust and oils on the outer glass surface and keeps them clean. The chassis is made of a magnesium alloy which makes them resistant to corrosion, sturdy and durable. The field of view for this pair of binoculars stands at 399 feet/1000 yards. 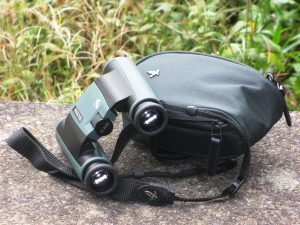 Although they are expensive, they can be referred to as the best all-around binoculars in the low light binocular industry. Leica Ultravid HD 8×42 binoculars are a state-of-the-art pair of binoculars. They are considered to be as close to optical perfection as any binocular can get. These binoculars employ fluoride containing lenses which tend to optimize the color fidelity and resolution. The anti-reflective coated lenses enhance the color resolution and light transmission abilities of these binoculars. The resulting images are absolutely stunning and have a sparkle to them which cannot be ignored. The color of the resulting images tends to move towards warmer and more natural hues. Leica Ultravid HD 8×42 binoculars are a compact and sturdy pair of binoculars with an aluminum body for increased durability. The AquaDura hydrophobic lens coating helps in repelling water and dust on the outer glass surface and makes cleaning easy. The dielectric prism coating is known to optimize the light transmission further. This pair of binoculars also makes it easy to have a fast and close focus due to an easy to use central doublewide focus knob. The field of view for the Ultravid HD binoculars is about 389 feet at 1000 yards but it feels like a lot wider when used. This pair of binoculars provides high saturation of colors along with micro contrast for beautiful images. They manage to keep the image-center free from veiling glare. 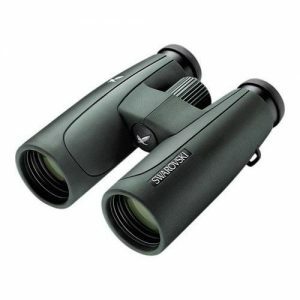 Swarovski SLC 8×42 W B binoculars are considered to be the real multipurpose binoculars. They are quite dependable for any kind of weather and are ideal for your outdoor excursions such as hunting, hiking, wildlife viewing, etc. They have pretty high-resolution powers with exemplary image clarity. The image contrast is equally great which results in larger than life images. Color saturation is almost perfect and gives an inherent glow to the image. Along with high optical and image quality, these binoculars possess excellent panning and tilting behavior. This pair of binoculars is slightly bulky, yet compact. The appearance is not that stylish but beauty is not a feature most people look for in a pair of binoculars. They provide great flare and shadow suppression which leads to better image quality. The high-definition glass enhances color, resolution, and contrast. The optical components such as lenses and prisms are fully multi-coated to provide better light transmission. Phase corrective coatings enhance the resolution and contrast while the anti-reflective coatings reduce reflection and glare. Swarovski’s Swaroclean coating does the best job in making the outer glass surface resistant towards water, dust and other impurities. The chassis is made of magnesium which makes Swarovski SLC robust and sturdy. These binoculars have a rugged and ergonomic design with an ease of view. 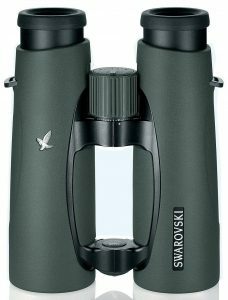 Swarovski SLC 8×42 W B binoculars also stand out because of their large field of view of 408 feet at 1000 yards. 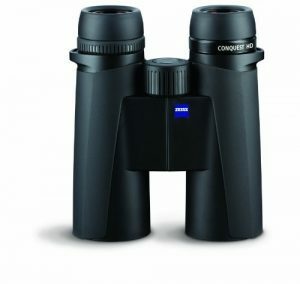 Zeiss Conquest HD binoculars offer superior optical performance at affordable prices. They use all the latest technology that makes them achieve high levels of resolution and image quality. The high definition lenses allow these binoculars to present spectacular and breathtaking views that set the standards for true color representation. Zeiss Conquest 8×42 HD binoculars are considered to be super compact for a pair of binoculars with 8x magnification power and 42 mm objective lens. The construction of this pair of binoculars is robust which makes them ideal for rugged use. These binoculars use Zeiss’ LotuTec lens coating that makes the lens water repellant thereby making this pair of binoculars waterproof and fog proof. This type of coating also provides dust resistance which reduces the risk of smudging and scratching the lens. The phase corrective coating enhances the resolution and contrast through the roof prisms used in this pair of binoculars. Along with the HD lens, the Zeiss Conquest binoculars make use of premium extra-low dispersion (ED) glass which provides high light transmission, resolution and color distinction along with low dispersion, distortion, and reflection leading to beautiful, bright and crystal clear images. The aluminum body makes this pair of binoculars compact and lightweight which is an essential feature for a portable travel gear. The ergonomic design includes handles that are reinforced with rubber to make them non-slippery thereby increasing your grip. This pair of binoculars is ideal for outdoor expeditions such as bird watching, hunting, hiking, etc. Zeiss Conquest HD binoculars are the perfect pair of binoculars for your next outdoor adventure. 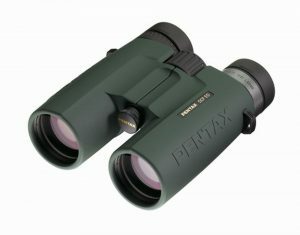 The Pentax DCF ED 8×43 Binoculars is one of the top binoculars produced by Pentax. They offer superior levels of brightness and edge to edge sharpness of the image. This pair of binoculars stands out because of the use of extra-low dispersion (ED) glass technology. ED glass is used to construct the objective lens, roof prisms and other optic elements which are phase-corrected and silver coated as well. This leads to an exceptional level of light transmission through this pair of binoculars, better color resolution and sharp imagery along with a reduced level of distortion and chromatic aberration. The antireflective coating reduces reflection off the air-to-glass surface. The chassis of Pentax DCF ED 8×43 binoculars is made of a magnesium alloy which makes them strong, lightweight and compact and is considered to be much classier than the usual polycarbonate chassis. The casing for this binocular is padded with high-quality rubber making it shockproof and the fine texture along with well-placed thumb indents provides a good grip. Also, these binoculars are completely waterproof, fog proof and dustproof due to the nitrogen filling. The features of long eye relief and close focus add to the charm of this pair of binoculars and makes them a valuable tool for use in any kind of situation. The field of view for the Pentax DCF ED binoculars is about 330 feet at 1000 yards. Meopta is a sports optic brand that has been known to provide high-quality optical products for over 80 years. They provide a variety of products such as rifle scopes, spotting scopes, high-quality binoculars, etc. 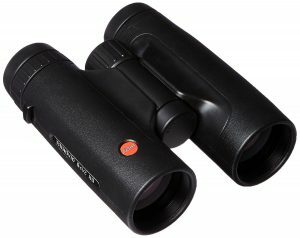 Meopta Meostar B1 8×42 binoculars have two features which make them quite the superstar that they are. Firstly, these binoculars provide high-quality optics packed in a very compact design which make them a portable travel gear. Secondly, the field of view for this pair of binoculars is significantly high at about 411 feet at a 1000 yards, which is not expected out of a pair of binoculars with 8x magnification power and a 42 mm objective lens. Most of the binoculars fail to provide both these features simultaneously at the configuration of 8×42. The optical components are of superior quality with fully multicoated lenses for better light transmission and phase corrective coatings on the BAK-4 prisms for reduced distortion. The lenses are coated with anti-reflective coatings as well to prevent reflection and glare. Meopta has developed two proprietary coating technologies namely MeoBright and MeoShield to provide clear viewing experience and protection from scratches respectively. The body of Meopta Meostar is made of aircraft grade aluminum which results in the lightweight and compact design and can survive in the toughest of terrains. The casing is protected with hard rubberized armor that makes them shockproof and suitable for rugged use. The exit pupils for this pair of binoculars are perfectly circular. Also, these binoculars provide close focus from a distance of 2 meters. These binoculars are waterproof as well and can be submerged in water without any problem. Unfortunately, this pair of binoculars lacks in an accurate color rendition and has a slight yellow tinge to its images which is an inherent weakness of all the products manufactured by Meopta. 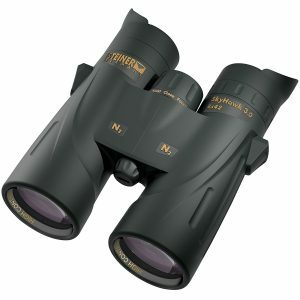 Nikon Monarch 5 is one of the best 8×42 binoculars available at a pretty decent price which never fails to impress you. These binoculars have much more advantages when compared to other binoculars in the same price range. This pair of binoculars has been designed to be used in any type of climate or terrain and is perfect for your outdoor adventures, be it hunting, hiking, or simply nature observation. For being useful in such situations, these binoculars are waterproof, dustproof and fog proof. Also, they have a rubberized armor to provide shock resistance and a robust and sturdy exterior. The compact and lightweight body allows them to be even more portable making them a reliable companion. 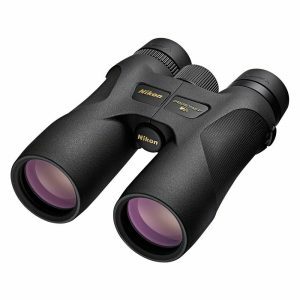 Nikon Monarch 5 8×42 binoculars make use of innovative lens technologies and roof prisms which significantly enhance the optical performance. They provide 8x magnification power and 42 mm wide objective lens. This pair of binoculars is perfect for those who wear spectacles because of the wide eyepiece. Also, the twister diopter ring is provided to compensate for the difference in the left and right eyesight. Nikon Monarch 5 also possesses a lot of user-friendly features such as smooth central focus knob, foldable lens caps, etc. This pair of binoculars employs multicoated Eco-glass lenses which are eco-friendly and ensure effective light transmission. The premium Extra-Low Dispersion (ED) glass provides the reduced levels of distortion and dispersion. The body of Nikon Monarch 5 is made of polycarbonate to provide much-needed shock resistance to withstand any kind of environment. 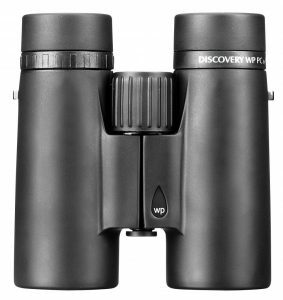 If you are looking for a small pair of binoculars that is lightweight and compact, yet provides the optical quality of any other binocular having the configuration of 8×42, then Opticron Discovery WP PC 8×42 binocular is the right choice for you. Opticron offers some of the smallest and low priced binoculars currently available in the market and Opticron Discovery WP PC 8×42 binoculars are considered to be one of the smallest waterproof roof prism binoculars due to their ultra-compact optical design. The small and compact design of Opticron Discovery WP PC doesn’t force this pair of binoculars to compromise on the optical quality as these binoculars come with a range of features including fast close focus, lightweight body, roof prism and water resistance. The roof prisms are one of the main reasons which make the design smaller but also provide these binoculars with the ability to tolerate severe conditions and improve their optical performance significantly. These binoculars are ideal for those who wear spectacles because of the wide eye lenses with long eye relief. The lenses are multicoated to improve clarity, brightness, and sharpness of the image and reduce dispersion, distortion, glare, and reflection off the air-to-glass surface. The polycarbonate exterior makes them suitable for rugged use and increases their robustness and durability. Carl Zeiss Terra ED 8×42 binoculars are the perfect choice for outdoor activities such as wildlife observation, bird watching, hunting, hiking, etc. These binoculars come with roof prism design and multicoated lenses for superior optical quality. Also, they are waterproof, fog proof and dust proof along with an additional feature of being submersion proof as well. These features are a result of weather sealed elements and nitrogen filling which ensure that you can use these binoculars in all kinds of situations. Zeiss Terra ED employs fully multicoated lenses that significantly increases light transmission through the binoculars thereby increasing brightness and overall quality of the images. The roof prisms are equally responsible for further enhancing the image quality. The use of Extra-Low Dispersion (ED) glass reduces the levels of distortion and dispersion of light off the air-to-glass surface. This pair of binoculars is lightweight and compact weighing less than 2 lbs. They are made from glass reinforced polyamide which makes them less wobbly. These binoculars are fully functional with high performing optical elements in use, yet they remain inexpensive. They are very effective in low light conditions as well making them suitable for wildlife viewing because it is believed that wildlife is the most active during dusk and dawn which tend to be the dark hours with poor light conditions. Zeiss Terra HD binoculars also come with fast close-focus mechanism and infinity zoom which is very appealing to hunters, birdwatchers, stargazers and sports enthusiasts. Vortex Diamondback binoculars are known to be the most durable pair of binoculars. They have been around for quite some time now but were redesigned to a much impressive version in 2016. They are also one of the most popular ranges of binoculars due to their lower cost and a wide choice of configurations they offer and have been the perfect solution for hikers, nature lovers, hunters, etc. 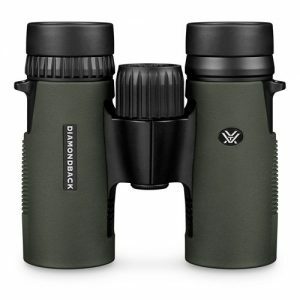 The Vortex Diamondback 8×42 binoculars are fitted with roof prisms, are lightweight and well balanced. They provide noticeably clearer images with greater contrast. The field of view is wider at 420 feet/1000 yards, which is more generous than its counterparts but the latest model has compromised slightly on the field of view by reducing it to 393 feet/1000 yards. This pair of binoculars uses phase corrected roof prisms and multicoated glass lenses which create stunning images. The external rubber armor is quite textured and provides a strong and quality grip. The dielectric coatings of the prism enhance image resolution, color, and contrast. The focus knob is quite precise and easy to use. Further, the O-ring seal makes them waterproof and fog proof as well. 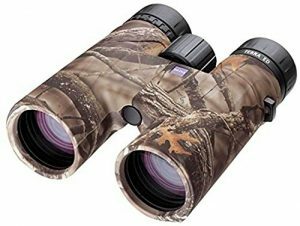 Now that you are aware of all the factors that you need to look for in an 8×42 binocular and have read about some of the most popular 8×42 binoculars as well, you are well equipped to pick the best pair of 8×42 binoculars which are suitable for your purpose. What are you waiting for? Choose among the best 8×42 binoculars and use it for your next outdoor adventure.